The legendary manager has stepped down as boss of the Banner this evening. A SLOW START from Laois in Cusack Park against Clare, but they powered their way to victory after stunning Clare with 1-04 in four mad minutes before half time in this second round senior football championship qualifier. A result that brought the end of Mick O’Dwyer’s time in charge of the Banner, the goals for the visitors came via John O’Loughlin and David Conway either side of the half time break and Ross Munnelly put the icing on the cake to erase the memory of Clare’s bright start. After watching the county hurler’s cruise to victory, the second part of the double header against Laois began with more reasons to be positive for the Banner as points from David Tubridy and Rory Donnelly helped them into an early 0-03 to 0-01 lead. Darren Strong had opened the scoring for Laois, but the O’Moore county followed that up with seven wides in the opening 15 minutes. That wastefulness was not punished and Laois would soon click into gear..
Colm Begley managed to narrow the gap for the visitors, but at that stage their defence continued to fall foul of the referee and Tubridy restored the two-point cushion before Donnelly landed another superb score from distance. Graham Kelly extended the lead further, but having stuttered through the first half against Carlow last time out, Laois were in familiar territory. Strong managed to ease some of the frustration with a 27th minute score to bring the gap back to just three points and Ross Munnelly was soon converting a free to make it a two-point game once more at 0-6 to 0-4. That was as good as it got for Clare however as Donie Kingston came alive, playing a crucial role in setting up O’Loughlin for his powerful finish and he quickly followed up with a point from play and a free either side of Conor Meredith’s point to leave the score 1-07 to 0-06. 1-05 without reply for Laois, 1-03 in the pivotal four minutes of the game. The second half brought more of the same after the break and early hopes of a double were soon dashed for Clare as O’Loughlin got the scoreboard ticking again before Conway put the result beyond all doubt at 0-6 to 2-09 by lobbing the goalkeeper after a smart ball in from Strong. By now, Laois were in cruise control and Kieran Lillis joined Munnelly on the score-sheet before Tubridy recorded Clare’s first in 25 minutes. Manager Justin McNulty began emptying his bench, but it gave little room for a Clare comeback and Laois managed to keep ticking over and show a difference in class to limit the division four side to just four points late in the second half before Munnelly snatched a injury time goal to put the icing on the cake and avenge the hammering dealt to Laois’ hurlers. Laois scorers: Ross Munnelly 1-04 (0-3 frees), John O’Loughlin 1-1, David Conway 1-1, Darren Strong 0-3, Colm Begley 0-2, Donie Kingston 0-2 (0-1 free),Conor Meredith and Kieran Lillis 0-1 each, Evan Costello, Tom Shiels (0-1 free each). Clare scorers: David Tubridy 0-7 (0-6 frees), Rory Donelly 0-2, Graham Kelly 0-1. Email “Mick O'Dwyer calls it a day after Clare's defeat to Laois”. 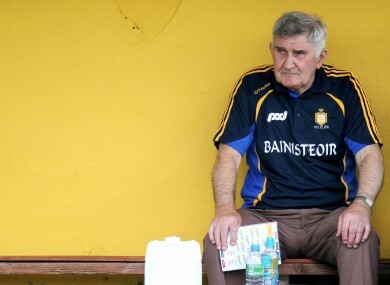 Feedback on “Mick O'Dwyer calls it a day after Clare's defeat to Laois”.